"Of course it is happening inside of your head, Harry, but why on Earth should that mean that it is not real?" In honor of today being "Back to Hogwarts" day, I'm recapping my recent trip to the Wizarding World of Harry Potter! So, cue the child-like excitement, because visiting this park basically felt like Christmas morning. I was stoked to finally get to visit this magical little world inside Universal Studios and to add to the fun, a generous stranger gifted us with "Front of the Line" passes since they had to leave super early... a.k.a we waited no more than a minute to get on any of the rides. Pure magic. So, without further ado, here's a quick tour through Hogwarts and Hogsmeade! First things first: grab yourself a frozen Butterbeer! Everyone always seems to always be curious what it tastes like and I'd say it's sort of like a cream soda meets an ice cream float (the frozen version anyway). In the words of JK Rowling via Bon Appetit magazine, "I imagine it to taste a little bit like less-sickly butterscotch." And that's exactly how it tasted. It was so sweet I couldn't even finish the one I was sharing with my friend, but it's none-the-less a very necessary part of the experience. Cheers! Honeydukes is the shop to grab all your chocolate frogs, every flavor jelly beans and whatever magical sweets strike your fancy. It was so fun wandering around the shop to see the different concoctions and candies from the books. As a true chocolate lover, I walked out with a box of fudge flies and a chocolate frog - delish! Ollivanders is a two-part shop stacked to the brim with wands. In the first room, they let in a group of people and single out one "wizard" to pick a wand. It's essentially a show, and once it's over you can pick out your own wand. It was fun, but I didn't actually get a wand so I suppose I'll just never know! Ah well. In addition to the Butterbeer carts, you can wander into Three Broomsticks to enjoy some English fare like Fish and Chips, Shepard's Pie and Pumpkin juice (or just more Butterbeer). I loved the dining hall ambiance because it instantly transports you into a Harry Potter film and it's truly hard to leave... I'm almost still holding out for that letter to Hogwarts. There are two main rides at the park; Harry Potter and the Forbidden Journey and Flight of the Hippogriff. The Forbidden Journey ride is the most extravagant, allowing you to travel through a sort of vortex that takes you into Hogwarts and then soaring through the sky and other traitorous adventures. It was SO much fun, we rode it twice and I thought it was hands down the best ride at Universal Studios. The second ride was pretty fun but super short, comparable to a mini-roller coaster. Even though there aren't a ton of rides, there's still plenty to be preoccupied with -- even if you're just "ooing" and "awwwing" around the castles and shops. The Wizarding World of Harry Potter definitely lived up to the hype and was so much fun! For any Harry Potter fans out there, it's basically a dream come true. I left the park wanting to re-watch every movie and can't wait to go back. 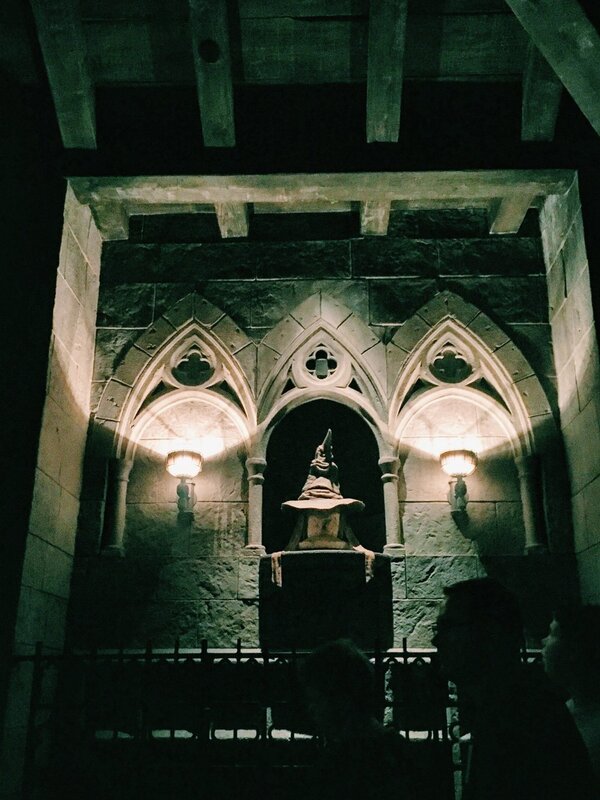 Have you been to the Wizarding World of Harry Potter in Hollywood or Orlando?